Deadpool 2 is currently in the process of casting some of the new characters, such as the beloved mutant Cable, and getting ready for production, which is expected to start this year. We already know Fox has plans for Deadpool 3 and an X-Force spinoff, but there has been talk of a potential Deadpool and Wolverine movie as well. Now, Deadpool writers Rhett Reese and Paul Wernick have weighed in on that very topic. The writing duo recently spoke with The Playlist about the Deadpool/Wolverine movie, which was not part of the plan originally. However, Ryan Reynolds really wants it to happen and he and Hugh Jackman are good friends, so it is definitely a never say never kind of thing at the moment. Paul Wernick is personally, very enthusiastic about the idea. Here is what he had to say. "We've come a long way from 2009, when we couldn't get the movie off the ground 'til now. And to have [this team-up]? It would be amazing to have Hugh resurrect Wolverine in the Deadpool universe, and again, Ryan's making a hard push to make that happen, and hopefully the public gets behind it and we can all convince Hugh to put the claws on one more time." Rhett Reese also likes the idea, but he explained that if Hugh Jackman does decide this is something he'd like to do, it will be tricky. Fox, Ryan Reynolds and the writing duo already have their plans for the Deadpool franchise mapped out, so finding a way to fit in a Deadpool and Wolverine team up movie would be difficult, but they will find a way to make it happen. Here is what Reese had to say about it. "If you're looking at 'Deadpool 2,' if you're looking at 'X-Force,' if you're looking at 'Deadpool 3,' there's not necessarily room for [another] team-up movie. I think it does create real scheduling and universe issues and something that could be ironed out, but it would need to be ironed out. I don't think any of us operated under the assumption that it would be even possible to do a Deadpool/Wolverine thing, so we just haven't planned for it, it's still not in the plan, but if it were to happen, it would require a hard look at the overall architecture of our storylines." A lot of this chatter surrounding a possible Deadpool/Wolverine movie started when a rumor circulated suggesting that Ryan Reynolds was going to have a cameo in Logan, which is supposed to be Hugh Jackman's last movie as Wolverine. That turned out to be untrue, but it got the conversation going. Both Reynolds and Jackman would likely be happy to get it right, since the first time they appeared on screen together in X-Men Origins: Wolverine didn't go so well. Rhett Reese reiterated that the Logan cameo is definitely not happening, and there is a good reason for it. "Yeah, that's not happening. The tones are just too different. I'm not sure exactly where that rumor came from, but Hugh and Ryan are really close and they really do want to work together and they really do want to see these characters come together, so in the long run, that rumor could become true, that they're in a movie together, but it's just not 'Logan.' And no, not even an end-credit scene." So that's that. Deadpool most definitely won't be showing up in Logan in any way, shape or form. But with what Rhett Reese says there about the tone, it almost makes it seem as though he is saying that the two characters can't mesh. He clarified, saying it is merely that Logan is too dark and different to work with Deadpool, but the two characters could meld together well in a movie that was written to include those two together on screen. "Well, when I say the tone doesn't work, I think the tone will absolutely work if we put those two together. Deadpool always needs a straight man, a foil, and Wolverine would be as good a foil as Colossus, just more cantankerous. I just know the 'Logan' movie as they conceived it could never have Deadpool in it and work. It just couldn't; it's way too serious and way too dark. It's just not right tonally. It's really, really different." 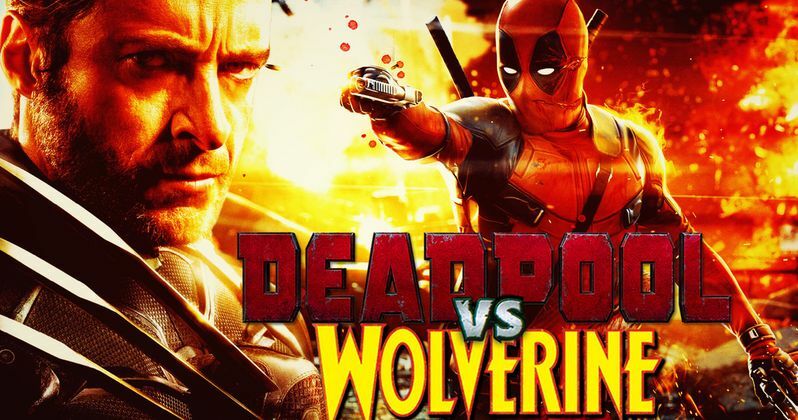 There is almost no question that Fox would love a Deadpool and Wolverine movie and everyone in the Deadpool camp seems to want it. Some things would need to be worked out, but it is certainly possible. All it would really take is for Hugh Jackman to say yes, but he has said that the timing doesn't feel right. So, it is hard to say if Ryan Reynolds can persuade him, but the writers seem to think it can work and that is very important. Deadpool 2 is the next time we'll see Wade Wilson and the movie is currently in pre-production, but Fox has yet to provide an actual release date. Perhaps Hugh Jackman will make a cameo appearance? We'll have to wait and see.